I blogged before about the quilt I wanted to make for my friend’s baby as soon as I found out she was pregnant. Although I knew the quilt would take awhile, that didn’t stop me from planning all the other projects I could do later. 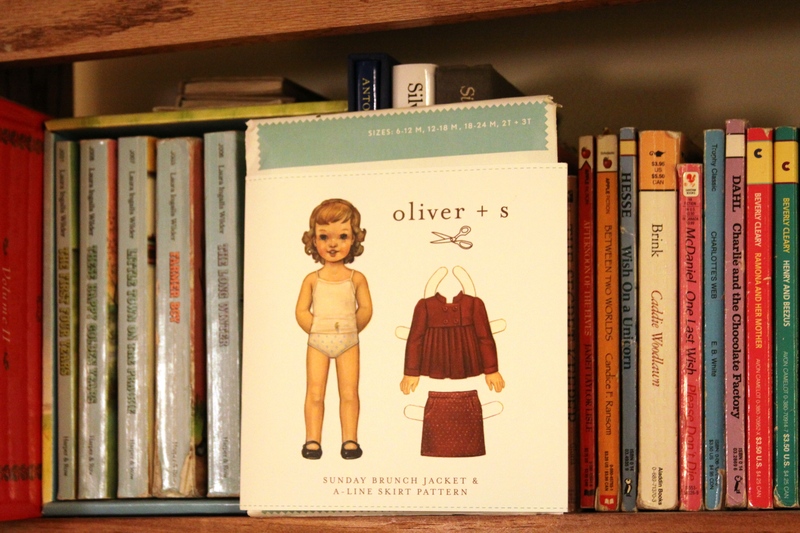 One such project emerged when I stumbled across a really adorable Sunday Brunch Jacket from Oliver + S, blogged about on the Purl Bee. What really caught my eye was the elephant fabric, which I knew my friend would love. (The stuff I used was similar but not identical.) I hurred online to buy the no-longer-current pattern and propped it against some books on my bookshelves–in the kids’ section, naturally–for months. A few months later, I packed up my apartment and put most of my things in storage when the boyfriend took a job in another city. The other day, I found the pattern in with some papers I kept out of the storage unit and realized with a shock that my friend’s baby is about to be too big for the jacket! I had to make it in a hurry! Nevermind that I haven’t made clothes before. 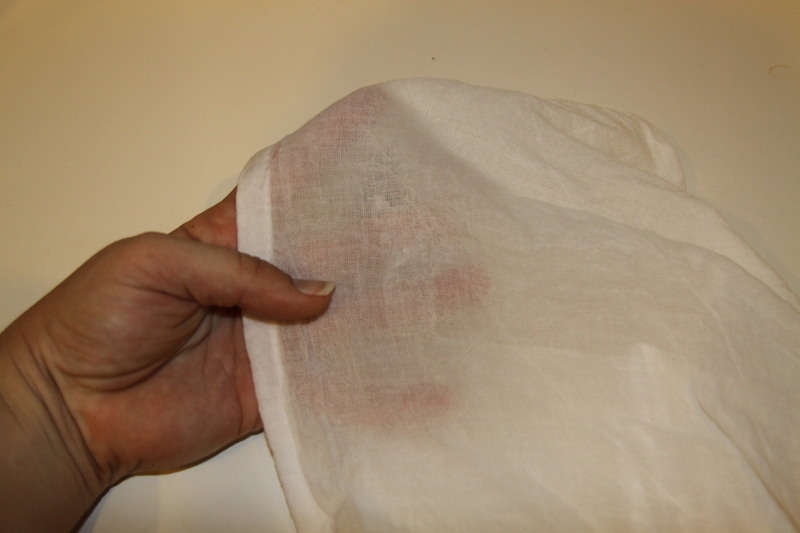 Or used interfacing before. Or gathered fabric before. I’m a learn-on-the-fly kind of girl. Which means it’s lucky I am okay with a few imperfections in creative work, something I can’t say for my professional work. My biggest challenge was the interfacing. At the quilt expo I attended earlier this fall, Nancy Zieman’s tips included something about interfacing; she said a particular brand is miraculous. I wanted to try the difficult version so I would have a basis for comparison. I really should have done it her way! I understand there was a right side and a wrong side of the interfacing for ironing, but for the life of me, I couldn’t get the stuff to stop sticking to the dish towel I “borrowed” from my sister (brand new – photos of gunked-up towel below). I’m just glad I tested it first! I followed the directions to a T, but to no avail. In the end, I held the iron just above the interfacing, steamed the heck out of it, and got it to adhere without actually touching the stuff with my iron. Took forever, but it worked! I was amazed to learn how easy it is to gather fabric. I expected that would be my challenge! Finally, I give myself about a 70% when it comes to sewing curved lines. Not a passing grade, but still about 65% higher than when I tried making a stuffed octopus with a circle piece in the template. (And the 5% I gave myself for the octopus project was more for effort than results.) I would actually consider tackling this pattern again. P.S. My mom and sister went shopping this weekend and bought me a new ironing board cover. No more ugly stains from zealous project work! Also no more interfacing from this project! 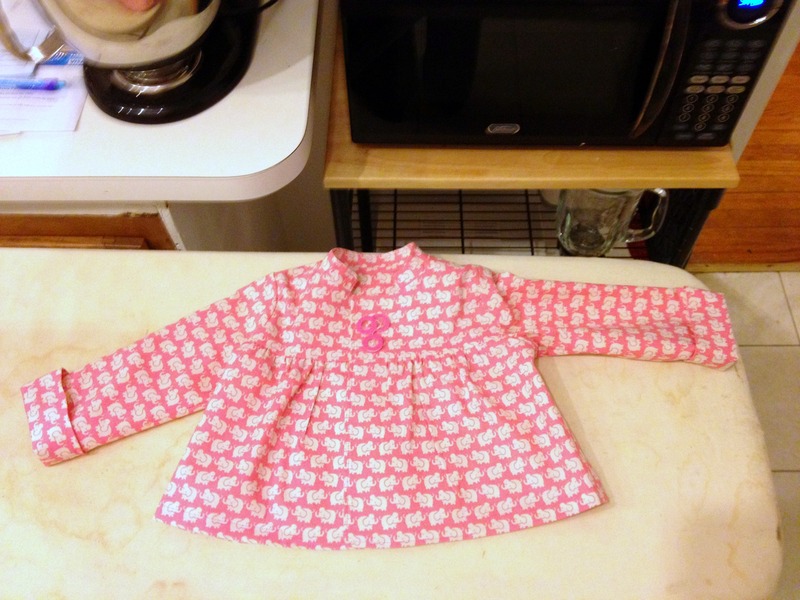 Categories: Other Sewing | Tags: baby clothes, elephants, gathering, interfacing, kid clothes, oliver + s, pink, purl bee, sewing, sunday brunch jacket | Permalink.